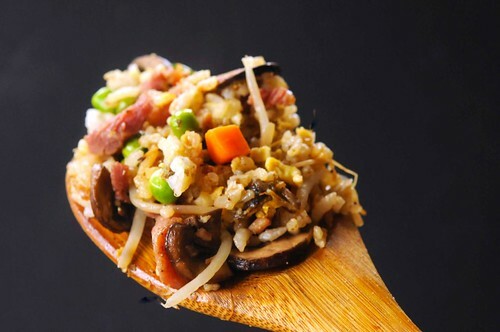 Ham and Veggie Fried Rice utilizes leftover ham and vegetables including mushrooms, peas, carrots, and rice in a stir-fry that’s easy to put together. Is it bad that this is the main thing I remember? Upon the impending marriage of my oldest son and his then-fiancé, her parents took all of us to a Japanese steak house in Little Rock. It was a wonderful night of celebration for both of our families. What I remember most was the fried rice, not to mention all the butter the chef used while making it. Of course, it tasted fabulous. But I wanted to figure out a way to make it flavorful at home without adding huge chunks of butter. I’ve been practicing ever since. What do you do with the bits and pieces of holiday leftovers? 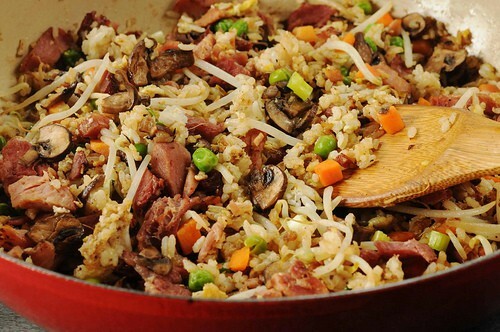 At our house, fried rice is all about cleaning out leftovers. 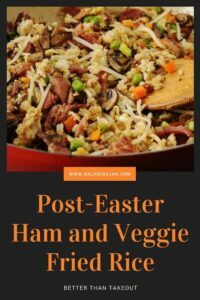 With Easter in the rear-view mirror, I have lots of leftover ham. I’m planning to make sliders with Cheesy Crusty Yeast Rolls and the bigger slices of ham. The ham bone is in the freezer waiting for a pot of beans. That leaves the little bits and pieces of veggies for fried rice. All ingredients except the rice are negotiable. Variety and amounts can vary. Even the rice can be more or less, but I wouldn’t go with less than 2 cups. Ham, various vegetables including mushrooms and rice stir fried together. 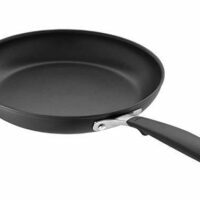 Preheat large skillet over medium-high heat. Add ham and saute. Smallest pieces should begin to turn slightly crispy like bacon. Set aside. Add 1 tablespoon oil to hot skillet. Saute chopped onions till soft and but not brown. Set aside. Add softened, drained mushrooms to skillet and saute until browned. Add peas and carrots and garlic and cook another minute. Set aside. Add 2 tablespoons oil to skillet. When glistening, add cold rice. Break apart and stir quickly to coat each piece of rice with oil. Add egg and continue to mix quickly as egg cooks. Add bean sprouts and cook another minute. 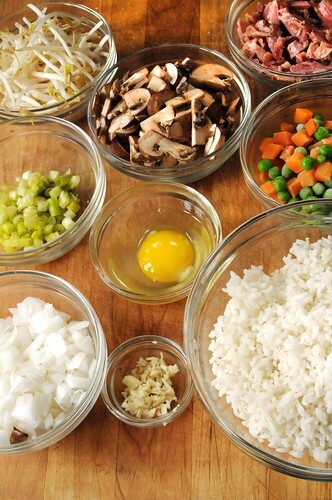 Add previously cooked meat and vegetables to rice mixture. Sprinkle scallions and soy sauce over mixture as you continue to stir and cook. Serve immediately. What a beautiful website. I have Easter ham calling out to me, this would be a great treatment. Your pictures and tutorial are very helpful. 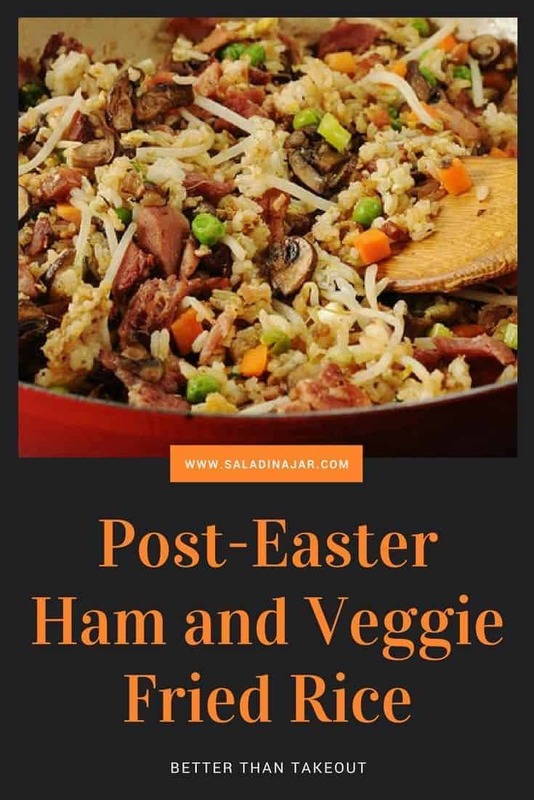 This is an excellent recipe to use up the rest of that Easter ham. This fried rice looks great! I have ham in the freezer that will work perfectly for this dish. I never thought about using ham. What a great idea! I will also use this recipe and subistitue chicken. This looks so good. Another great one I’m sure!! !